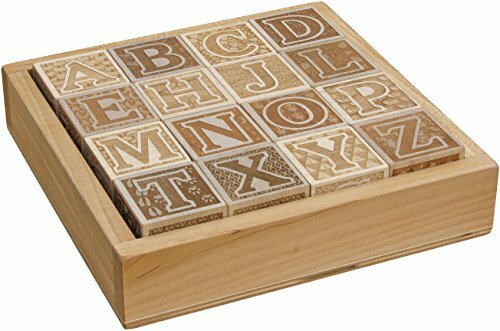 This set of sixteen elaborately Engraved Natural ABC Blocks is indeed an heirloom set. Crafted from locally sourced, sustainably harvested maple hardwood, each block is a 1-3/4" cube with simple clean letter designs against densely detailed backgrounds. Blocks are completely natural with no finish. This set of intricately detailed blocks are sure to become an heirloom. Each block depicts a letter and then in the background an image is shown. For example C - cat, or E - earth. 16 blocks will spell over 250 basic words and phrases. The maple tray makes for great storage.